Situated in one of the world's hotbeds of innovation and creativity, SF State has a student body buzzing with ideas that can change the world -- and it also has the potential to help students bring these ideas to life. So says Sean Bolton, a senior majoring in business with a philosophy minor. Bolton recently completed the prestigious University Innovation Fellows program, which empowers student leaders across the country to push their campuses toward increased creativity through online training, mentorship and peer feedback. 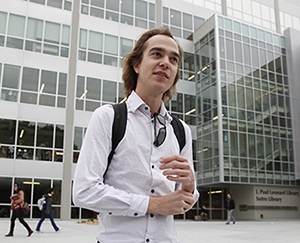 Senior Sean Bolton developed a plan to encourage a greater focus on entrepreneurship and innovation at SF State. Tell me about your experience with the University Innovation Fellows Program. It was fascinating to see students across the country working to do something related to innovation and entrepreneurship at their schools. If nothing else, the value of the fellowship was to realize that this is happening all across the United States, in every type of school. As part of the fellowship, we were asked to create a multi-year strategy to encourage innovation at our school. The first step in my plan is to create an online community, then add in-person meet-ups, which shows need and interest. As the strategy goes forward, there is a push for more classes focused on innovation and entrepreneurship, and eventually for the creation of a dedicated space. Students can feel a bit disconnected from each other when they have an idea and have trouble finding someone to work with. This space would create a campus community where people can find each other and work together. Why do you think encouraging innovation and entrepreneurship is an important goal? At SF State, we have entrepreneurship and innovation resources that exist as blips on the radar all over the place. It could be a club with only five members, or a class in a department you would never think it would exist in. I wish there was a way I could have been connected to these pockets of innovation earlier on. I want to find a way to help students be aware of what currently exists and build on that. To me, even moving the needle a little in the direction I'm trying to go is a huge win. I'm excited to see what SF State students can come up with because there is a lot of energy here. Were your plan to be fully realized, how would the campus be different? Right now, you could go into any classroom and ask, "Who here has an interesting idea for something they want to create to change the world?" and at least half of the class would say something -- and it would actually be a pretty cool idea. But these ideas usually don't get a chance to go anywhere. SF State has such a diverse and interesting student body, and also has this activist tendency. I see a lot of liveliness and energy in the future around creating things that haven't existed yet and students feeling a sense of pride about being here and having the school support them making something different for the world. What will you take away from your SF State experience? There are so many fascinating people in my classes and in San Francisco. When these people get together, some pretty amazing things can come out of it. I can pinpoint certain professors who changed my way of seeing the world. Some people drop out of college to do the startup thing, but there's a really important element of being in school. It's like atoms bumping up against each other, sharing ideas and changing trajectories depending on other students and your professors. Do you see yourself founding a startup? At some point in the future, definitely. To me, working at another company at first would be a way to learn from how they do things.